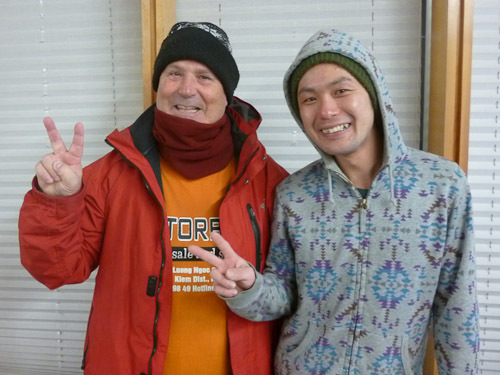 This afternoon I went with my mate Toshi to the Onsen at Niseko Village. 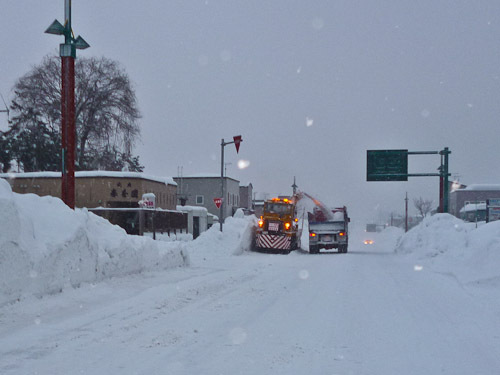 Snow clearing at Niseko Village. We stopped at the Post Office for a while so I took some photos of the main street. Toshi at the Post Office. 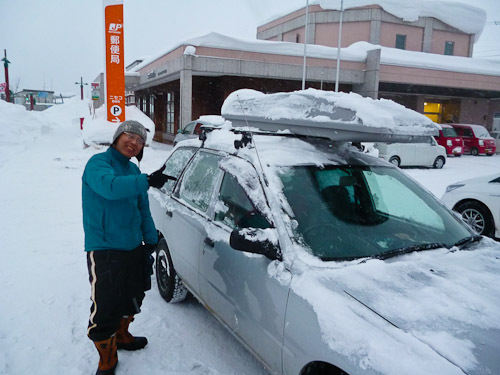 After that we went to the onsen where we had a bath and jumped into the icy cold water outside. 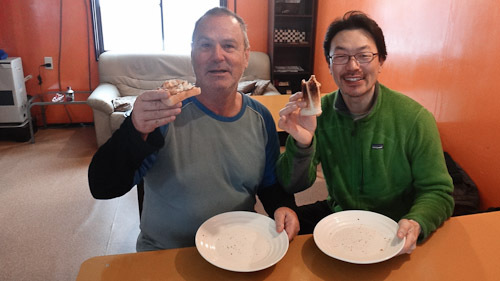 I met my old mate Kohei, whom I had met at Jindabyne. 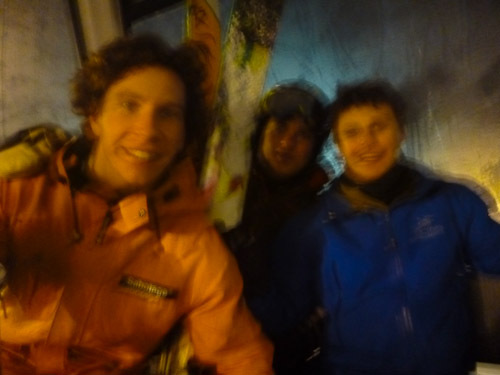 Last night I went night skiing at Hirafu with the Swedish kids. There was no new snow so the pistes were pretty chopped up and cruddy. 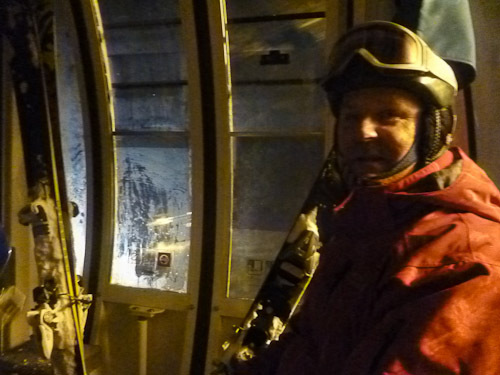 Me in the gondola at Hirafu. There was some fresh snow a couple of days ago. It was strange because up top the snow was wind-packed and heavy and down low in the trees there was fresh stuff that was lots lighter. Today was sunny for a change and I even got a bit sunburnt. I headed up to the Gondola about eight thirty and had a few warm-up runs before I headed over to the quad chair. 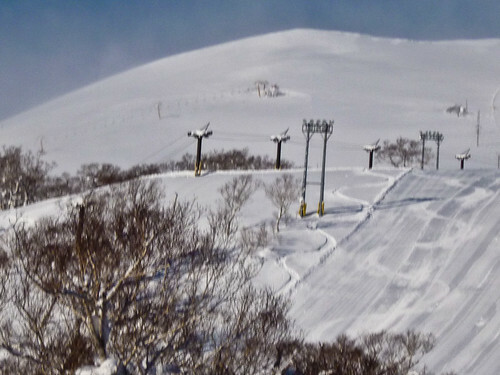 I had a few runs on Ace Number three chair. 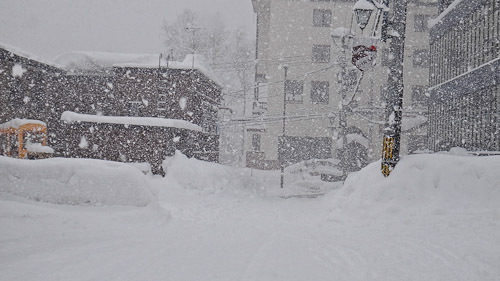 The powder was all right, but a bit patchy with wind-packed stretches. Going up Ace #3 chair-lift. That was looking towards skiers right of King Number three hooded lift. 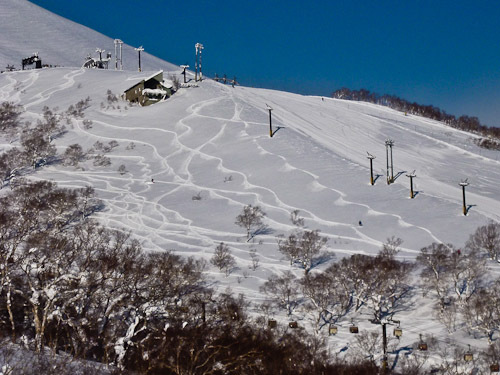 You can see new lines going through the fresh powder. After that I went up Ace Number four chair and traversed across to Annapuri. Annapuri had hardly any people so it was straight onto the chairs without any waiting at all. 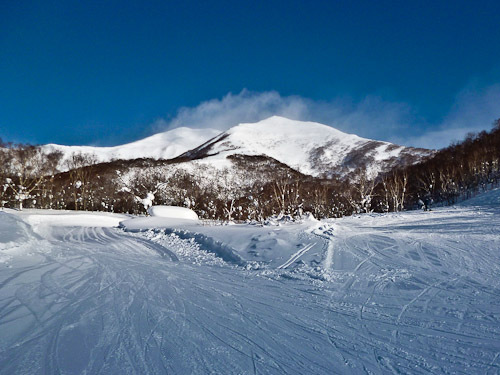 This morning was the first time in a few days that I have been out skiing. I have been sick all week with the flu. The whole hostel has come down with the virus and everyone is sniffling and coughing. My Korean friend Kim came to visit me. He is living in Sapporo. We had eggs on toast for dinner. 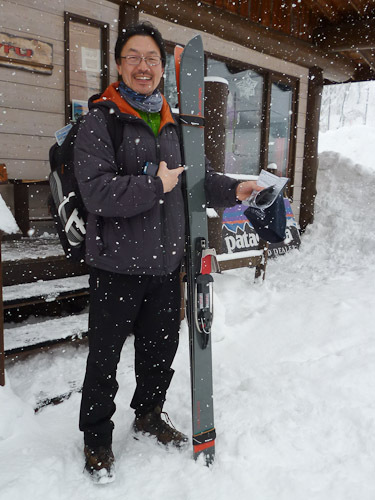 I went up the hill with Kim to get his new skis from the Toyfu shop. They are Japanese skis, Vector Glide.